The gold miners’ stocks have soared this year as investors flock back into this long-abandoned sector. Many traders wonder if these eye-popping gains are merely the product of fleeting sentiment that could reverse anytime, or are supported by strong underlying fundamentals. With the gold miners reporting their latest quarterly operating results, this extensive new data offers great insights into gold mining’s fundamentals. By law, publicly-traded companies must file quarterly earnings reports four times a year. These yield a treasure trove of valuable information for traders, and are easily the single-most-important contribution to financial-market transparency. The Securities and Exchange Commission requires companies traded on the US stock markets to file quarterly earnings reports no later than 45 days after their quarters end. For reasons that mystify me, the gold miners love to push this limit. Despite having modern computer accounting systems that can produce final numbers within days of quarters ending, most of the gold miners report 4 to 6 weeks after quarter-end. Rather ironically, many issue press releases within a week or two after quarter-end that contain some of the key information to later be included in their quarterly reports. So 6 weeks after every quarter-end, I like to dig into the operating results of the world’s best gold miners to get a better feel for how this industry is faring fundamentally. But unfortunately, there’s an exception to the SEC rules for the fourth quarter. They extend the reporting deadline out to 90 days after the end of that particular quarter. So naturally many of the already-slow-to-report gold miners take advantage of this slack. As an investor, the idea of Q4 results coming out near the end of Q1 irritates me to no end. With plenty of gold miners reporting way out in mid to even late March, their Q4 data is practically ancient history by then! But as a CPA and former Big Six auditor, I understand the Q4 delay. Producing annual reports, or 10-Ks in SEC terms, is far more time-consuming than the much-smaller quarterly reports known as 10-Qs. The 10-Qs filed during the first three quarters use unaudited numbers, so there’s no need for CPA firms to investigate and sign off on them. 10-Ks require fully-audited results, and the months after Q4 are the busy season for auditing where CPAs are swamped. And the vast array of data and analysis included in 10-Ks takes way longer to collect, organize, proof, and publish than the rest of the year’s quarterly reports. So doing my quarterly analysis of gold miners’ operating results is more challenging after Q4 because less data is available. But I’d much rather use what’s out there now than wait until the very end of Q1 to take a look at Q4’s results. Many gold miners issue press releases summarizing key Q4 results even before they file their 10-Ks, so they’re a great source of early data. And Q4 was exceedingly important for gold miners. With gold soaring as high as 17.5% year-to-date last week, and the flagship HUI gold-stock index literally skyrocketing 62.4% higher in less than a month, the psychology in this sector has shifted radically from Q4. Remember that was a horrendous hyper-bearish sentiment wasteland, where everyone was utterly convinced gold and its miners were doomed. That all swirled around the Fed’s imminent rate hikes. Despite history showing that Fed-rate-hike cycles are bullish for gold as I proved before the December hike, American futures speculators were convinced otherwise. So they pounded gold relentlessly from late October after the Fed indicated a December rate hike ending 7 years of ZIRP was indeed likely. By the day after that hike, extreme record futures selling had crushed gold to a dismal 6.1-year secular low of $1051. Gold’s average price in Q4 was just $1105, the worst since Q4 2009. This was widely believed to be an existential threat to gold mining. As recently as last summer, $1200 gold was erroneously seen as the breakeven level for the gold industry. So the HUI was hammered to a brutal 13.3-year secular low in November, even though gold miners’ Q3 operating results argued such levels were fundamentally-absurd. Thus Q4 2015 was arguably one of the toughest quarters gold miners have ever faced. While it’s certainly true past quarters many years ago had lower gold prices, mining costs were commensurately lower then too. Q4 was a real test of how the gold miners could function in a super-low-gold-price environment. So I’ve been impatiently waiting for enough Q4 operating results to analyze this industry for over 6 weeks now. This week I looked into the latest data from every elite gold miner of the dominant GDX Market Vectors Gold Miners ETF. GDX is an outstanding sector benchmark that almost perfectly mirrors that HUI index. I filled a spreadsheet full of the available data from each GDX component company, some of which is summarized in these tables. Considered as a whole, they offer great insights into this industry’s fundamental health. Each company’s symbol, stock exchange, and weighting in GDX as of the middle of this week is noted. GDX’s managers effectively weight their positions by market capitalization, which is probably the best way to do it since it eliminates any selection bias. Market caps are followed by the quarter from which each company’s data emerged. Again that was problematic due to that loose 90-day deadline on Q4 reporting. 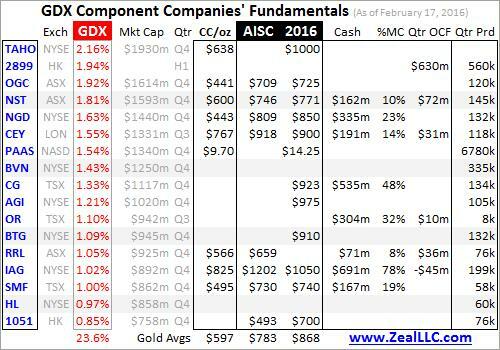 While GDX had 36 component companies as of the middle of this week, only 34 fit in these tables. But they account for over 98.6% of the weighting in GDX, as well as much of the world’s gold mining. These companies mined roughly 11,710k ounces of gold in Q4, or 364.2 metric tons. According to the World Gold Council, total global mine supply in Q4 was 809.8t. So about 45% came from these GDX stocks alone! The first data column shows each GDX miner’s cash costs per ounce of gold mined. Cash costs have dominated gold-mining financial reporting since the 1990s. They include all direct production costs, mine-level administration, smelting, refining, transport, regulatory, royalty, and tax expenses. That’s what it currently costs to produce each ounce of gold. They are the acid-test measure of gold-miner survivability. And cash costs were incredibly low in Q4 as the miners tightened their belts in response to the rotten gold prices. They averaged just $587 per ounce across these elite GDX gold miners, 5.0% lower than Q3’s average of $618. This industry cash-cost level is the gold price traders need to fear. As long as gold is trading above $587, the miners can continue producing gold and paying their bills necessary to survive. Remember at worst in Q4, gold fell to $1051 the day after that Fed rate hike. The gold miners’ stocks were trading near 13-year secular lows on that, at prices last seen in July 2002 when gold was trading near $305 and had yet to exceed $329 in its young secular bull. Yet gold was priced $464 higher than the direct costs of mining it! So obviously the gold-stock Apocalypse the bears cooked up was a pile of crap. While cash costs are a worst-case-scenario metric for gold mining’s survivability, all-in sustaining costs are far more important for its ongoing viability. Cash costs are misleading because they don’t include many major expenses essential for mining gold. So the World Gold Council introduced AISC in June 2013 to provide investors with a more realistic and representative portrayal of the true costs of gold mining. All-in sustaining costs include all direct cash costs of mining gold, and much more including corporate-level administration. It’s always been suspect that the high-level people running companies weren’t considered a relevant cash cost. More importantly, AISC include everything necessary to maintain and replenish operations at current production levels. This is critical since gold mines are constantly depleting. All-in sustaining costs therefore also include exploration for new gold to mine, mine development and construction expenses, remediation, and reclamation. AISC are a far-superior measure to cash costs since they reveal the ongoing cost of maintaining gold output. As long as gold miners can produce their gold at AISC less than prevailing gold prices, they can generate surplus cash flows and profits indefinitely. 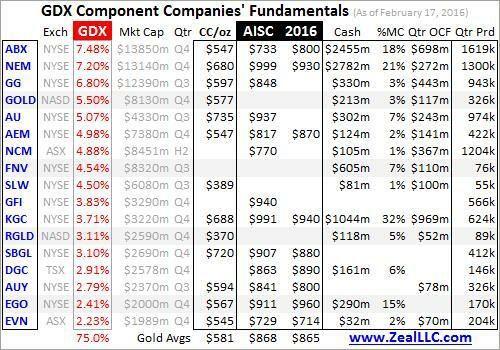 In Q4 the elite GDX component stocks reported average all-in sustaining costs of $836 per ounce. That is 3.5% under Q3’s levels. So at gold’s secular nadir of $1051, the gold-mining industry was still able to generate positive cash flows of $215 per ounce mined. And at Q4’s average gold price of $1105, those jump to $269. Contrary to popular belief, despite their ludicrous stock prices gold miners were thriving in Q4! In order to threaten this industry’s ability to generate positive cash flows while maintaining existing levels of production, the gold price would have had to plummet all the way to $836. While Q4 certainly saw downside gold predictions abound, even the most vociferous bears weren’t calling for such brutally-low gold prices. This fundamentally-sound gold-mining cost structure proves the absurdity of Q4 gold-stock levels. With this industry able to effectively earn $269 per ounce of gold mined, the idea that it was righteous for gold stocks to trade at levels last seen in July 2002 at $305 gold was far beyond ridiculous. A $269-per-ounce profit represented a hefty 24% margin, heights many industries would die for. As I argued at the time in the dark heart of Q4, the gold-mining sector was the most radically undervalued in all the stock markets! The gold miners never deserved such extremely-low prices fundamentally, they were truly absurd. So Q4’s entire gold-stock disaster was purely the product of sentiment, a superstorm of popular irrational fear. And excessive fear never lasts, it soon burns itself out after everyone susceptible to being scared into foolishly selling low has already sold. That leaves only buyers, igniting a powerful mean reversion higher. The gold miners’ Q4 financial reports don’t only include Q4 and full-year-2015 all-in sustaining costs, but their AISC projections for 2016. They’re noted above in the next column. This year the gold miners are expecting AISC to run $866 per ounce. Incidentally, managements have strong incentives to overstate expenses and understate production in forecasts. That way they have room to beat and exceed expectations. The stock markets often greatly reward companies in all sectors that beat expectations, while punishing those that fall short. Not long ago on February 5th, tech darling LinkedIn plummeted 43.6% in a single trading day after saying its Q1 outlook was lower than previously thought! Gold-mining executives are compensated with stock options and often own sizable equity stakes, thus they’re keen to manage expectations. So odds are this industry will have AISC in 2016 under its conservative average $866-per-ounce target. One reason is gold mining is very fuel-intensive, so the super-low oil prices driven by oil’s global supply glut will reduce operating expenses. But let’s assume that $866 AISC projection for this year is right. That means the gold miners are going to generate massive cash flows and profits as gold mean reverts higher. At $1200 gold, $866 AISC yield $334 per ounce in surplus cash flow. And since the majority of mining costs are largely fixed when mines are designed and built, expenses don’t rise in lockstep with gold. If gold rallies just 8.3% to $1300 for example, profits swell 29.9% to $434 per ounce. The leverage to gold that gold miners’ profits and therefore stock prices offer is extraordinary, which makes them so attractive. This industry’s strong cash flows and cash positions were readily evident in gold miners’ Q4 results as well. The next couple columns show each GDX component company’s cash position at the end of Q4, and its percent of their current market capitalization this week. Not only did many of the gold miners have lots of cash in their darkest quarter, but they generated tons more as quarterly operating cash flows indicate. As long as companies can produce positive cash flows from operations, and they haven’t been profligate in borrowing, there is no threat to their ongoing viability. And the strong operating cash flows generated by the gold miners even in miserable Q4 with gold languishing near deep secular lows is serious testament to their fundamental health. There’s no doubt gold stocks’ powerful run higher is fundamentally justified! Last week I published a popular essay exploring gold-stock upside targets derived from a fundamental perspective based on their operating profitability. And even if this new gold upleg somehow stalls out, the gold stocks are overdue to at least quadruple out of their recent deep secular lows! Their new Q4 operating results confirm that outlook, that the gold miners’ stocks still have massive fundamental upside from here. Such a mean reversion would catapult the HUI from this week’s levels around 150 to 400+, likely within the next year or so. And as gold-mining profitability continues to improve this year as gold continues to mean revert higher, the bullish fundamental case for the gold miners will only grow stronger. I plan to keep updating this research about 6 weeks after every quarter-end, to keep tabs on gold miners’ latest results. And because Q1, Q2, and Q3 reporting won’t require audited numbers and doesn’t include the arduous process of producing 10-Ks and annual reports, the upcoming 2016 installments on the fundamental state of the gold-mining industry will be much more complete. I’m already really looking forward to the Q1 results, which are almost certain to show exploding operating cash flows on these higher gold prices. So if you’ve been dragging your feet on investing in gold stocks, it’s not too late. This entire sector was beaten down to such fundamentally-absurd price levels late last year that it still has epic mean-reversion rallying left to do to merely return to some semblance of normalcy. As always, the easiest way to play this super-bullish gold-stock sector is through buying that leading GDX gold-stock ETF or its call options. But also as always, the gains within this sector will sort out like a bell curve. Some gold stocks will really underperform their peers, most will see average gains, and some will see huge outperformance. These right-end gainers are usually the miners and explorers with the best fundamentals. So there’s no doubt an expertly-picked portfolio of the best of the gold stocks will trounce the broader gains mirrored by GDX and the HUI. I’ve intensely studied and traded gold stocks for decades now, and there are a surprising number of GDX component stocks that I’m not the least bit interested in owning. I suspect they will be a big drag on gold-stock portfolios. But there are other GDX stocks that have fantastic potential to far outperform their peers, as well as a big universe of high-potential smaller gold stocks that fly below the GDX-inclusion radar. That’s why you need us at Zeal. As zealous contrarians, we’ve long specialized in gold-stock and silver-stock research and trading. Unlike the majority of analysts who capitulated and walked away in those recent dark years, we kept on studying and learning. That makes our hard-won knowledge unparalleled and exceedingly valuable, as we won’t have to spend years getting back up to speed like most others. You can put our expertise to work for you with our acclaimed weekly and monthly newsletters. They draw on our vast experience, knowledge, wisdom, and ongoing research to explain what’s going on in the markets, why, and how to trade them with specific stocks. We’ve done many hundreds of gold-stock and silver-stock trades over the decades, earning fortunes for our subscribers. We aggressively added new trades in recent months, with many already having unrealized gains ranging from 40% to 80%+! At just $10 an issue, you can’t afford not to subscribe. We’re still running our popular 20%-off sale for now, join us today! The bottom line is the gold miners thrived in bleak Q4 despite their stock prices and gold languishing at deep secular lows thanks to horrendously-bearish psychology. This entire industry was producing gold at all-in sustaining costs averaging under $850 per ounce, proving it never faced an existential threat as was widely assumed. Even in Q4’s gloom, the gold miners were generating large operating cash flows.